Description: Great as a natural form of pest control in your kitchen or conservatory, insect-eating plants are also a great way to get children involved in gardening. 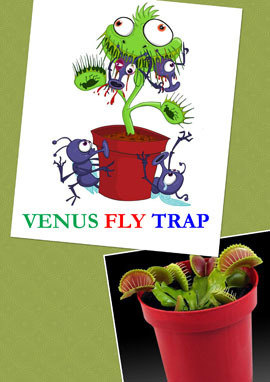 Beautiful as single specimens in attractive containers, or grouped together with suitable props to create bizarre 揗artian� landscapes, Venus flytraps and the like can be the basis of a brilliant mini-project for the school summer holidays. Venus flytrap (Dionaea muscipula) is the most fascinating for children, since the toothed, jaw-like leaves suddenly snap shut on any fly that lands on a leaf, triggering the guard hairs that control the mechanism .GETTING STARTED Carnivorous plants are adapted by nature to grow in boggy ground that lacks nitrogen, so they obtain their nutrients by digesting insects. When you buy them, they will already be growing in suitable compost and won抰 need repotting that year. Stand the pots inside a larger container that holds water. Use moss or pebbles to hold the pots steady and hide the rims (you can add scraps of driftwood as suitable decoration). Keep the outer container topped up to the halfway mark with water throughout the summer. Use only clean, fresh rainwater (leave a bucket out to catch it), or water that抯 been filtered then boiled in the kettle and cooled, which removes chalk and chlorine. Carnivorous plants are happy standing in several inches of water, but if you抮e going away for a while you can safely top the container up to the rim. The important thing is to make sure they never dry out. WHERE TO GROW YOUR PLANTS Carnivorous plants like plenty of sun. They are happy outside in summer, on a patio or round the edge of a pond (where they will catch midges), but they also do well on sunny windowsills in a conservatory or kitchen.